It's been a full on week of creativity here in our little old household, I've been on a real colourful journey through the Come Away with Me, An Eerie Tale and Twelve Days of Christmas collections and now have four crates worth of G45 gorgeousness all packed up and ready to take to Peterborough early doors on Saturday. I've had two crafty accidents this week. I was stabbed on the cheek bone by the corner of a flying tray and then stood on the paper trimmer blade that had fallen on the floor. That one was more painful than a paper cut. No accidents today thank goodness lol!! The new collections arrived earlier in the week but I hadn't had a chance to look at them properly until today. Ohhh my they're all gorgeously different but equally as beautiful. I love all the colour ways, and the fact that they all work with other G45 collections too. We'll be using some of them in the workshops that are coming up too. Here's a list of where I am over the next month. If you fancy coming along and joining me for a crafty day G45 style click the link to the shop and call for more info. omg Clare this is beautiful!!! I wasn't crazy about the new Christmas collection when I got a sneak peak of it, didn't like the colors, but your box is beautiful!!! How is your cheek and foot? Oh gosh I didn't realize paper crafting was so dangerous!!! Lol, take care. 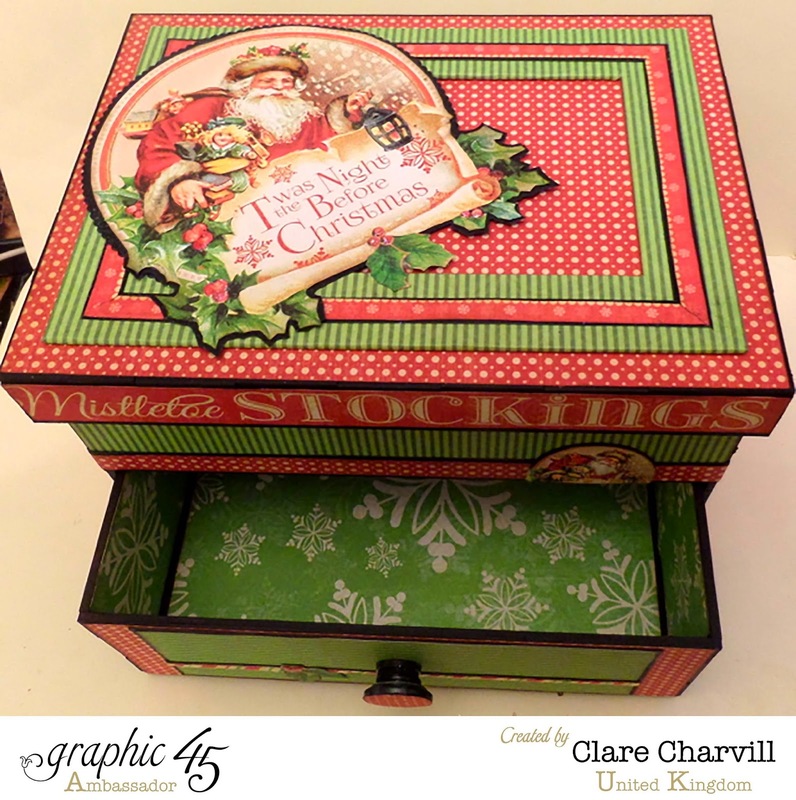 this is gorgeous Clare, such beautiful papers and beautiful made. Morning Clare, This project is, as always, fabulous !! I love the 'Twas the night before Christmas' tale, and I adore these papers, absolutely gorgeous. Let's hope you are accident free now. 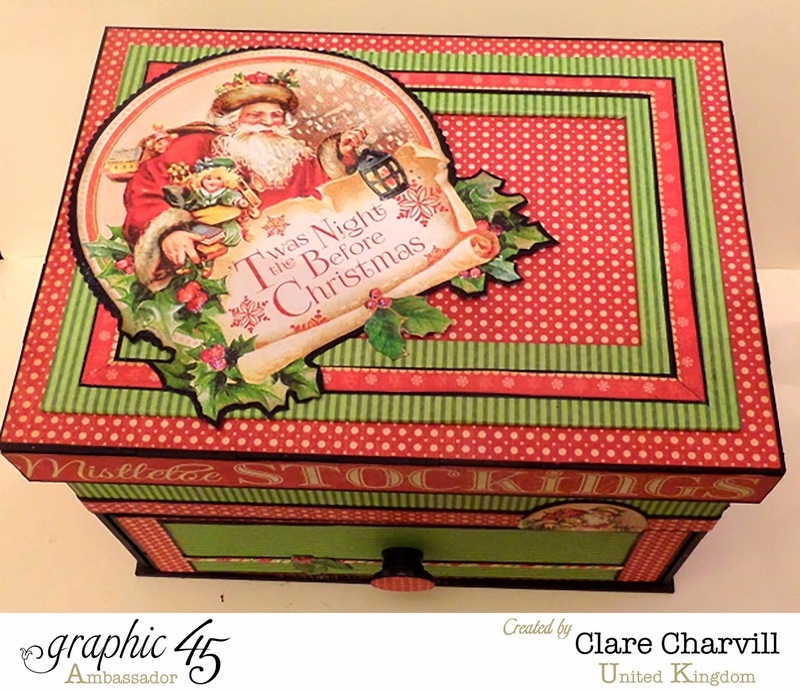 Will you have this Christmas box directions available for purchase anytime soon? We'll have to workout the exchange rate to dollars when/if you do. I've been hoarding last year's Christmas collection for the perfect project. And there it is! I so wish I lived in England so I could take some of your classes! Everything you create is beyond lovely and I look forward to each and every one of your posts! Thank you! Clare's classes are always great fun and quite relaxed. Good luck with the shows over the weekend Clare. See you soon. Hope you don't have anymore accidents. Hi Clare , have just watched you for the first time with leonie on C and C , what a super show. Loved your demos and will now be on the lookout for more! 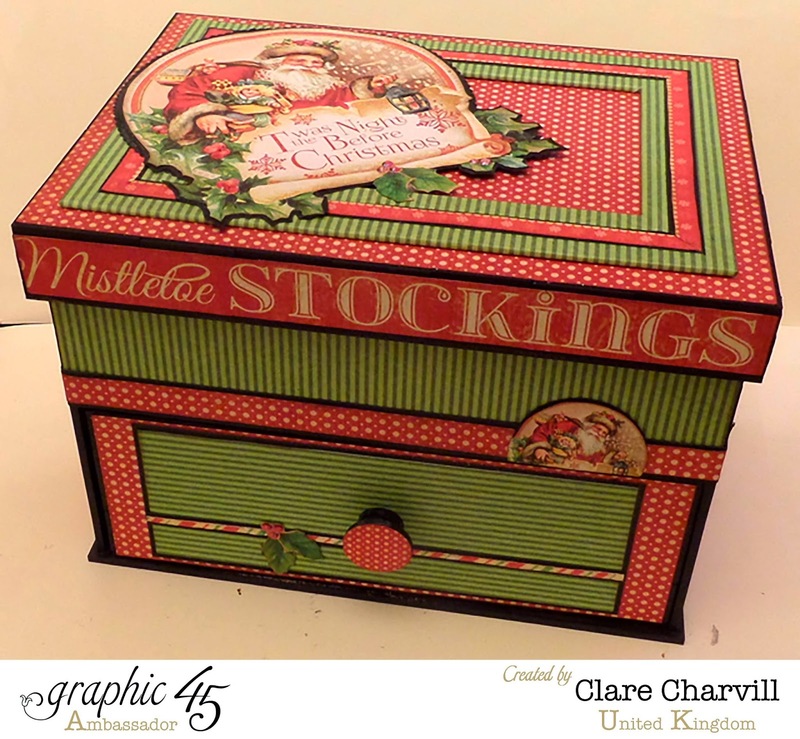 I love graphic 45 and the Botanical tea papers have me in their grip! Great to see you and Leonie having fun as you craft! By the way , protective clothing when you are crafting may be the answer!!! Watched you on the "telly" yesterday on Create and Craft. I love all the things you do of course and as one fan said above I wish I could come to the UK and take your class as well!!! Have a great weekend, I didn't see any damage on your cheek so either you are a fast healer or concealer does a wonderful job!!!! Just kidding, take care. Hello Clare just to say enjoyed the weekender g45 on c+c youre demo,s were supper love you,re projects too, but was disappointed with the sets they had for sale. Errie tales was so like Steampunk Spells and Halloween .however I did like the Comeaway with Me.set but found it too much both price and pads did,nt want 2pads 12/12 and stickers would of been better.sorry if ive offended you but I did like you,re shows.